When we were in Chicago last, we did an architecture tour. There are a host of organizations that do these tours, but we chose the Chicago Architecture Center for ours. Chicago is rightly proud of its architecture. The Great Fire burned most of the town, which cleared the way for a late 19th-century renaissance. We took the Gilded Age tour that highlighted this era. 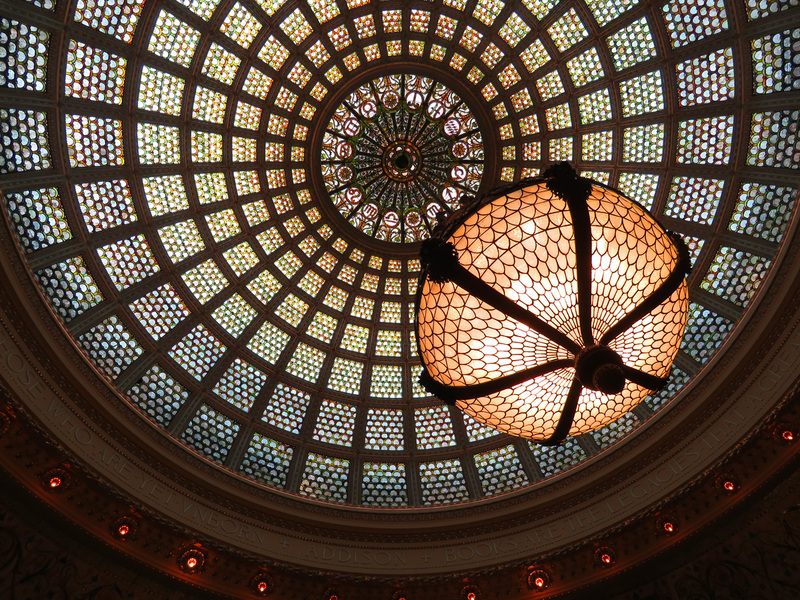 Our tour ended at the Chicago Cultural Center, with its beautiful beaux-arts Preston Bradley Hall. Its stained glass dome is fantastic. It took twenty-five years for the cultural center to be built. There was a land dispute between those wanting to build the center and another group wanting to commemorate Civil War veterans. After much squabbling, they eventually decided to split the difference and divide the site in two. Nowadays, it is run as one by the city, but touring the building you can definitely see the dichotomy that once existed in its architecture.